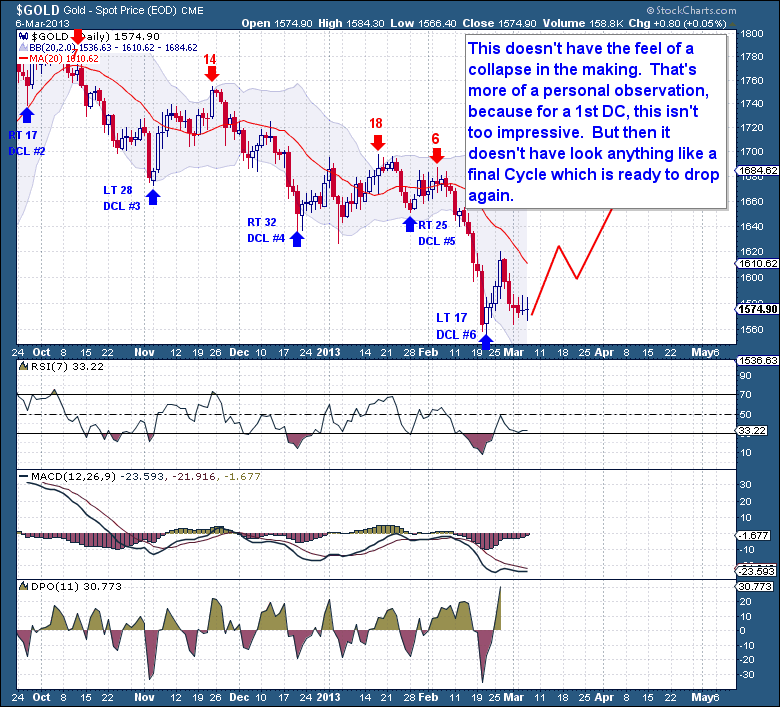 The gold chart is hardly inspiring here, especially when we believe this is the 1st Daily Cycle. But that might just be “on the surface”, because I’m seeing a lot of resilience in the tape and plenty of divergences. The character of this 11 day old Daily Cycle just doesn’t have the feel of a final collapsing Cycle, so it’s puzzling to see this indecision in the chart. I guess the reality is that a big rally out of what I expect to be a major low (Feb) has yet to take hold. But I also know that traders are always impatient to see a big rally after an ICL or Yearly Cycle low. Yes it’s certainly true that the most common behavior for most new IC’s is to rally hard out of the low. So when we don’t see this type of rally materialize with good follow through, we immediately become defensive and expect the worst. But it’s also important to point out that most of the big Cycle Lows, primarily those that mark yearly and multi-year lows, often exhibit very similar characteristics to this Cycle. For example both the D and A Wave lows coming out of the 2008 collapse had near 100% retracements in the 1st Daily Cycle. I’m not using this as a defense to explain this weakness, it’s more of a valid observation. At this point, the best course of action is to sit tight, and let the Cycle unfold. There is an argument to be made for both the bearish and bullish case, so therefore it does not help anyone to push either scenario too hard. For now, I want to see a move and close above $1,587, this is the March 1st high and it would represent a Swing Low covering the most recent period. From that point, the next step should be a fairly quick take-out of the $1,620 mark and new DC highs. Taking out $1,620 from this point would be a very positive development. Again please note that I’m defining what we need to see in the “bullish case”, so until then, don’t get too excited! This as is an excerpt from Midweek’s premium update published on Wednesday (3.06) focusing on the Gold Cycle from the The Financial Tap, which is dedicated to helping people learn to grow into successful investors by providing cycle research on multiple markets delivered twice weekly, as well as real time trade alerts to profit from market inefficiencies.